Poll: Legit Attack on Smollett or Hoax? 1. Dummy goes to Subway at 2am (who the hell eats Subway at 2am???). 2. Dummy gets mugged b/c he's on the streets of Chicago at 2am. 3. Dummy utilizes the Democratic strategy of "Never waste a crisis"; goes back to apt and concocts a story of homophobia and racism. 4. Media eats it up. So do we lump all homosexuals together in a single block of liars? Seems to be the MO of some who frequent our midst. Negative. I would assume most are truthful until proven otherwise. 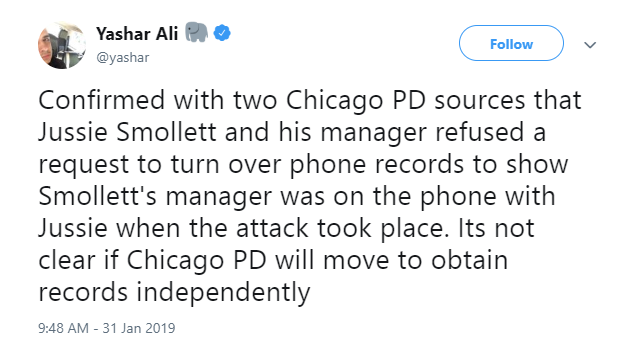 However, there's quite a few holes in Smollett's story so far and the investigation has only just begun. I presume that people are telling the truth until proven otherwise. Hence, why when the story first broke I didn't question it until some evidence of holes in the story began to emerge. After Covington, I'm skeptical of almost every story put forth by the media. But Hawk didn't do that. You should have been skeptical long before Covington. You're right. I meant to say even more skeptical than before. Thanks, I wasn't sure by the style of the post if SoMs was insinuating that I did or if it was sarcastic. Chicago police have confirmed that the victim says his attackers yelled "MAGA" at him. The term was not in the initial report, but the victim shared that part of the attack in a follow up interview, and it appears in a supplemental report. Also, police have released video that they say contains "potential persons of interest." (01-31-2019 10:30 AM)Schadenfreude Wrote: Chicago police have confirmed that the victim says his attackers yelled "MAGA" at him. The term was not in the initial report, but the victim shared that part of the attack in a follow up interview, and it appears in a supplemental report. He didn't volunteer that his attackers sayd "MAGA", but only said that they did after police asked him. Who the hell runs around at 2AM in the bitter cold yelling MAGA attacking people. This is obviously fake as hell. Because no one was buying tickets to see him? Get your tickets now while you can. I Root For: Memphis !! (01-31-2019 10:35 AM)BuffaloTN Wrote: Who the hell runs around at 2AM in the bitter cold yelling MAGA attacking people. This is obviously fake as hell. i have no idea if it's fake or not, but I have found over the last few years that when there's an accusation that is a caricature of social media talking points, it usually ends up being fake. Will not be surprised if surveillance video shows him leaving Subway and entering his condo/apartment without an altercation. This reminds me of something from my own life. I was pulling out of a business onto a major road on an uphill grade and turning right on that road with my eyes focused on oncoming traffic. It's a major road and you never see pedestrians there at all so I didn't fully turn back to see if anyone was on the sidewalk before I pressed the gas. Next thing I know there's a guy on my hood on a bicycle that then slides into the roadway. He's laying in the road moaning and my GF at the time is trying to check him out while I call 911. Cops show up first and check him out. Guy looks homeless. He told my GF his left leg hurt but then he told the cops it was his right. No apparent cuts or bruises. EMT shows up and then a very nervous me notices the cops are telling jokes with each other. The EMT's even have to send them scolding looks, because they are cracking up so much. One of them tells me to go home and he'd call me. Two hours later I get the call and he says there are no charges, and the guy is fine. The guy was on the sidewalk and going in the wrong direction. He also apparently had been hit by cars in that same place 5 times in 2 years. What's that a Southern Miss tailgate? The “persons of interest” were walking away from the scene of the alleged assault, 15-30 minutes before it happened.